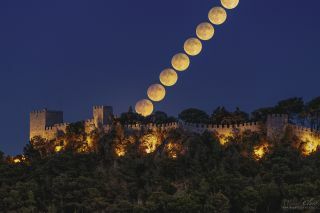 The Harvest Moon rises over Sesimbra Castle, Portugal. This image was taken by Miguel Claro, who said the disc of the moon reached 100% illumination exactly at the same time it was rising in the Portuguese sky. The Harvest Moon shone bright on Friday night (Sept. 16), and lucky skywatchers in some parts of the world were in for a rare treat as a subtle lunar eclipse coincided with the dazzling full moon. Only viewers in Africa, Asia and Australia were able to see the shadowy eclipse, which is known as a "penumbral" lunar eclipse. But the full Harvest Moon was visible in clear skies anywhere on Earth. Check out our full gallery of reader-submitted penumbral Harvest Moon eclipse photos here: Harvest Moon Lunar Eclipse of 2016. During a penumbral lunar eclipse, the moon passes through the outskirts of Earth's shadow. The shadow cast by Earth causes the moon to appear slightly darker than usual for a few minutes. The difference is subtle and not easy to see with the naked eye. Photographer Stojan Stojanovski captured this photo of the penumbral Harvest Moon eclipse at maximum over Macedonia. Photographers around the world were able to capture the Harvest Moon — with or without the penumbral eclipse — in its full glory Friday night. The moon still appeared full for a few days before and after its peak. The photo above shows the lunar eclipse at its maximum. It was taken by Stojan Stojanovski near Lake Ohrid in Macedonia. Muhammaed Rayhan of the Jakarta Planetarium & Observatory in Indonesia was able to observe the eclipse with the naked eye. As he watched, the north side of the moon became noticably darker. The Harvest Moon over Indonesia during a penumbral lunar eclipse. This photo taken by Muhammad Rayhan shows the Harvest Moon eclipse as seen from the Jakarta Planetarium & Observatory in Indonesia. September's full moon is called the Harvest Moon because the bright moonlight helps to illuminate fields where farmers might be doing some late-night farming during the fall harvest season. In this photo by Stuart McNair, the rising Harvest Moon illuminates farmland during sunset on Sept. 15, 2016 north of Toronto, Canada. "This was the scene just north of Toronto, Ontario but representative of fields everywhere as the low-lying full Harvest Moon provided additional light for farmers to harvest their crops," said Stuart McNair, who took the photo above. "In this case, the farmer is bailing hay and the geese are about to settle down for the night as the sunlight gives way to moonlight."